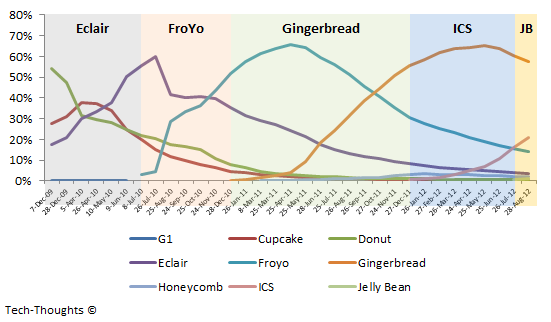 In one of my earliest posts, I had described the cyclical nature of Android fragmentation, by measuring a few basic statistical properties exhibited by Android's version distribution. Let's take a look at the current state of fragmentation with the latest version distribution data. 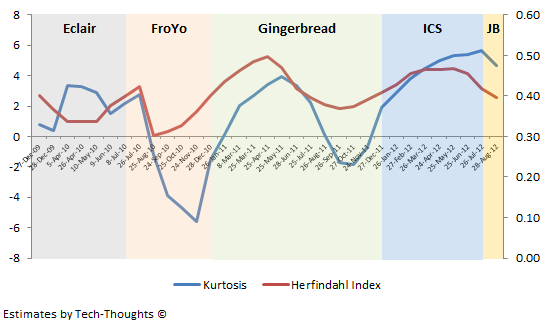 The H-Index has also seen a drop over the last few months (a negative from a fragmentation perspective) thanks to the early launch of Jelly Bean. However, it has just dropped below 0.40 and is still within the "safe" range of 0.50 to 0.33 that I had defined previously. 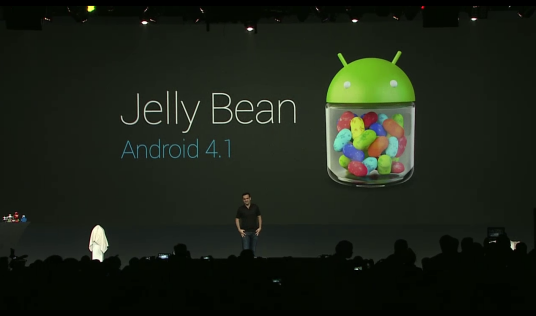 This should continue to drop until ICS penetration overtakes Gingerbread for the #1 spot and Jelly Bean overtakes FroYo to become the third largest Android version. Update: Kurtosis, in the chart above, is invalid in this situation as the underlying assumption of normally distributed data has not been met. Thanks to Matthew Gardner for pointing this out.